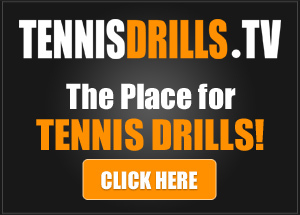 This video shows an simple and effective progression for learning how to hit a chip & charge on the return of serve. Great tip, thanks, is there progression to teach making selection between chip or tops return. When (slower) chip got killed by opponent poach we regret not hittng topspin return but when we hit topspin out we regret the other way. Yan… I typically get into those decision making ideas after a spend a few minutes with the student. What works best for me is to be standing next to my student and helping them decide which returns should have slice and which needed topspin. Very interesting. I work mostly with young/beginning players on the local high school team and this is something I will definitely integrate into my drills. One thing I noticed right at the end of the video after Carly(?) hit the second volley, you commented ‘perfect’. This brought to mind my own coaching experience on calling any shot/stroke ‘perfect’. I used to use ‘perfect’ just as you did to praise a student for correctly executing a shot/drill. Now I use ‘excellent’ instead of ‘perfect’ if the drill was performed correctly. I changed because I found that some players would take the comment ‘perfect’ as acknowledgment that they have mastered the stroke and need no further practice/improvement. I’m fairly sure that you well know that there is always room for improvement at any level which is why the pros continually practice. This is just a thought that I felt you might find ‘perfectly interesting’. I notice that you ‘choke up’ on the racquet handle a lot when you demonstrate. Do you advocate this on returns? Not really… it’s just a habit I have.. but it would be a good thing to try if the player is struggling. I have a problem in running thru the shot on the way to the net. It will tend to float. With a weak 2nd serve would you suggest a lighter grip? It would seem to me I couldn’t get enough on the ball. I think our comes down to mastering the different amount of power coming from the body vs the swing itself. The lighter grip is worth testing to see how it feels. Great. The awareness of this let alone the practice should help with my chip and charge game as well as when you’re forced into moving forward and have to do a controlled push of a low ball, which I frequently over play past the baseline. This is a great drill. Thanks for all the great tips and drills!! 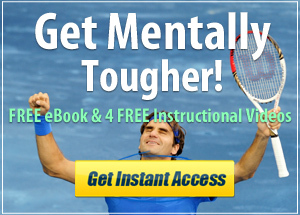 Awesome Scott… I can’t wait to share with everyone a new course I am preparing titled Building Tennis IQ – it should be available this summer. Congrats on your win. Excellent way to build a more aggrieve charge. Drills helps reduce the hard hit which sometime goes out. Keep up the drills. Thanks Phil… It has been one of my better progressions for helping players. Great approach to the chip and charge technique! It is a great way to take advantage of a weak serve, particularly if sent back to the opponent’s weak hand. Great to revisit this technique while waiting for the snow to melt.